Major is an elevated rank in the Jiralhanae military ranking system, indicating seasoned experience in the service of the Covenant. Majors are experienced soldiers of the Covenant, making up a portion of the Jiralhanae ranking system. Majors often lead files and lances of lower-ranking Jiralhanae and Unggoy on the battlefield. Compared with the Minors, the Majors exhibit better combat skills and tactical maneuvers. As such, they are given better armor protection and have access to better armament. During the Great Schism, they were given better armor and weapons. Those serving under the Chieftain Tartarus wore an armor set composed of a forward facing helmet, a wraparound neck brace, and upper-arm braces with flat, pronged armor plates. This set was completed with a set of bandoliers wrapping around the chest and back, and leather wrappings holding pieces of metal between the toes. This configuration was also shared with the Jiralhanae Captains who served with them, which held a red holographic flag displaying the clan insignia mounted on the back. 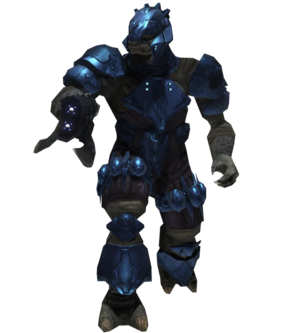 When the Jiralhanae became the dominant military force of the Covenant during the events of the Great Schism, Majors were given blue-colored full-body Jiralhanae power armor. The armor donned by the Majors is still basic and only offers limited protection, but it still superior compared to the armor worn by Jiralhanae Minors. Jiralhanae Majors are armed with a large assortment of weapons, including Type-2 spike grenades, Type-25 Spikers, Type-25 Brute plasma rifles, Type-33 fuel rod guns, Type-25 Brute Shots, Type-51 carbines, and Type-52 Maulers. Majors are also equipped with deployable cover for additional cover. Like all Jiralhanae in Halo 2, eliminating a Jiralhanae Major takes a considerable amount of firepower due to their "bullet-sponge" trait. The best way to eliminate them is by removing their helmet caps with a couple of shots before finishing them off with a headshot. The Majors are typically seen sporting Brute plasma rifles and Covenant carbines. Occasionally, they'll wield Brute shots. They are usually seen commanding less experienced Jiralhanae, Unggoy, and Kig-Yar. They become very aggressive, more so than the Minors, when they start to berserk. In Halo 3, Jiralhanae Majors are now equipped with power armor, colored in blue. Compared to the Minors, the armor given to Majors are equipped with some form of energy shielding. The armor falls apart when the shielding is removed and the armor takes too much damage. They typically use Spikers, and occasionally use carbines, Brute shots, and plasma rifles. In Halo: Reach, Majors are synonymous with Captains. They do not have energy shields, but are equipped with gold helmets that let them resist multiple headshots. In Halo 3 the Major is difficult to distinguish against the Jiralhanae Ultra, due to a similarity in their armor characteristics; its shape and the undergarment layer. However an Ultra can be identified from the violet tint in their armor. In Halo 2, instead of color, the armor itself signified rank, as a blue variation also existed. A Jiralhanae Major in Halo 2 Vista. A Jiralhanae Major from Halo 3. A Major/Captain in Halo: Reach.